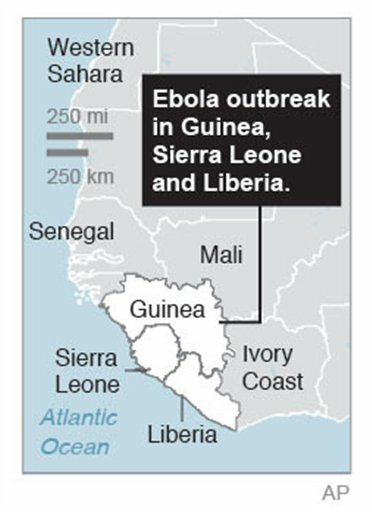 The international medical organization Doctors Without Borders sounded the alarm Monday over the outbreak of the Ebola disease in West Africa as some 20 new deaths have been reported. 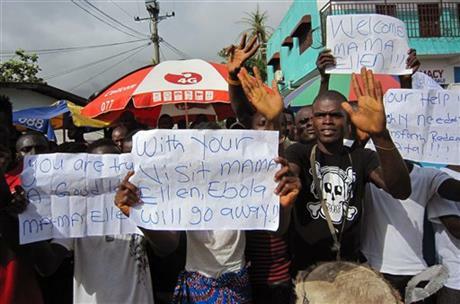 In its own statement Monday, the World Health Organization said that the latest figures show 567 cases with 350 deaths in Guinea, Liberia and Sierra Leone. Last week the organization reported more than 330 deaths. Most of the deaths, 267 of them, are in Guinea, but with Sierra Leone reporting 39 new cases and eight deaths between June 15 and 17, growth there appears to be faster, according to the organization’s figures. The World Health Organization said it is working with local governments to provide the necessary expertise and is planning a regional meeting in Ghana on July 2. But Doctors Without Borders, known by its French initials MSF, said that the outbreak will require a “massive deployment of resources” by governments and aid agencies to bring it under control. The organization, which earlier said the outbreak was out of control, said it is stretched to the limit and is having trouble responding to an epidemic that is breaking out in more than 60 locations across three countries. This Ebola outbreak is the most deadly ever. The virus has no cure and causes internal bleeding and organ failure, spreading through direct contact with infected people. Containing an outbreak focuses on supportive care for the ill and isolating them to limit the spread of the virus. Medical facilities in these countries, some of the poorest in the world, are struggling to deal with the outbreak as well as educate populations unfamiliar with how to prevent the disease from spreading. The current outbreak, which began in Guinea either late last year or early this year, had appeared to slow before picking up pace again in recent weeks, spreading to the capital of neighboring Liberia for the first time. Posted on 25th June 2014 by newsafrica. This entry was posted in Africa, Ebola, Equatorial Guinea, Guinea, Morocco, MSF, Sierra Leone, United Nations and tagged Ebola virus disease, Guinea, Liberia, Médecins Sans Frontières, Monrovia, Sierra Leone, West Africa, World Health Organization. Bookmark the permalink.